All our services are at your disposal to make your shopping experience the best it can be. The Bank of Montreal ATM is situated at the door 4 entrance. Other ATMs are located in the center of the mall, in the food court and at the door 7 entrance. To make a special moment with your child even more pleasant, we have made a breast feeding room AND a family room available to you, next to the door 3 entrance. Take advantage of the comfortable chairs, changing tables, bottle warmers and microwaves. On the behalf of Carrefour Angrignon, we would like to wish you a sweet experience! Changing tables are available in the men’s and women’s bathrooms, located in the hallway beside the food court. To allow you to stay connected, Carrefour Angrignon is pleased to offer you access to free Wi-Fi throughout the mall. 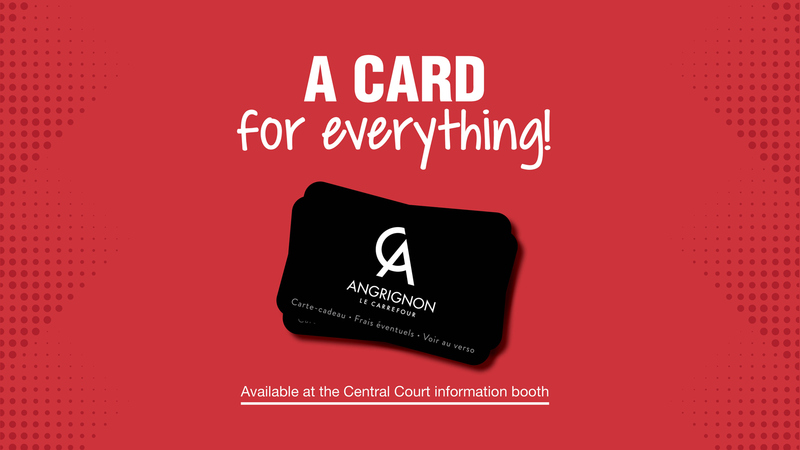 Our giftcards are available at the customer service desk in the center of the mall. Amounts varying from $10 to $500, offer the value you desire! Payment types accepted: cash, Interac, Visa and Mastercard. All lost objects are brought to our customer service desk in the center of the mall. Call 514-363-9413 to claim your item. Located next to the bathrooms beside the food court is a recycling bin for used batteries, as well as a recycling bin for used small electronics in the center of the mall. We offer reserved parking spaces near each entrance for those with mobility disabilities, families, and car pools. Stroller rentals are available at the customer service desk in the center of the mall. Please take note that it is required to leave a valid driver’s license or medicare card with photo, until you return the stroller to the customer service desk. Limited quantities available. No reservations. Wheelchairs and walkers are available to you free of charge at the customer service desk in the center of the mall. Please take note that it is required to leave a valid driver’s license or medicare card with photo, until you return the wheelchair or walker to the customer service desk.